Navratri special upvas ka Rajgira Thalipeeth. There are very few recipes that are perfect for fasting days, and one among them is Rajgira Thalipeeth. 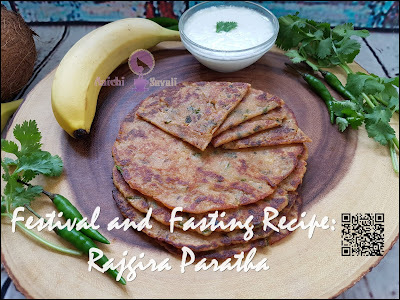 Rajgira Paratha or Thalipeeth is one of healthy, easy and gluten-free rajgira flour recipe suitable for fasting / upvas. 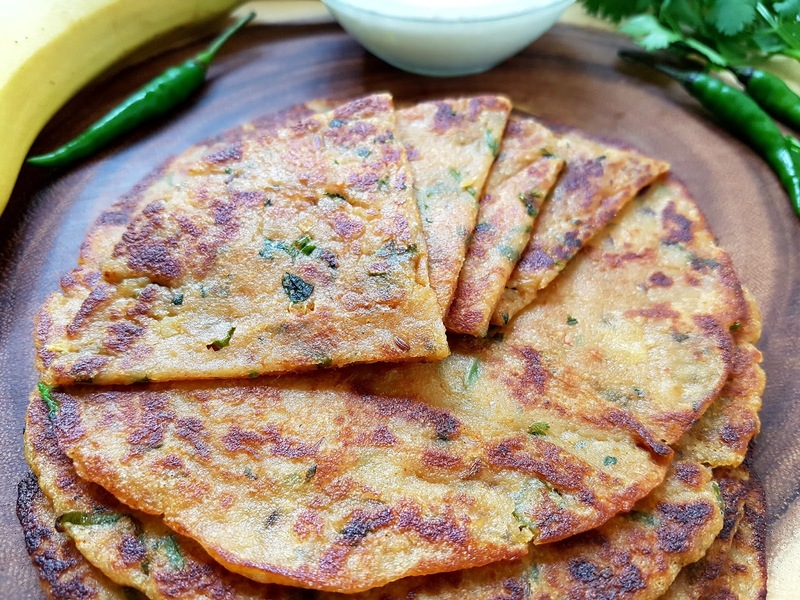 Normally for singhara, kuttu, and rajgira paratha, puri is made with potato using as a binding agent, so here I have used potato, so this is a great recipe for upvas as most of the upvas recipes revolve around the potato. 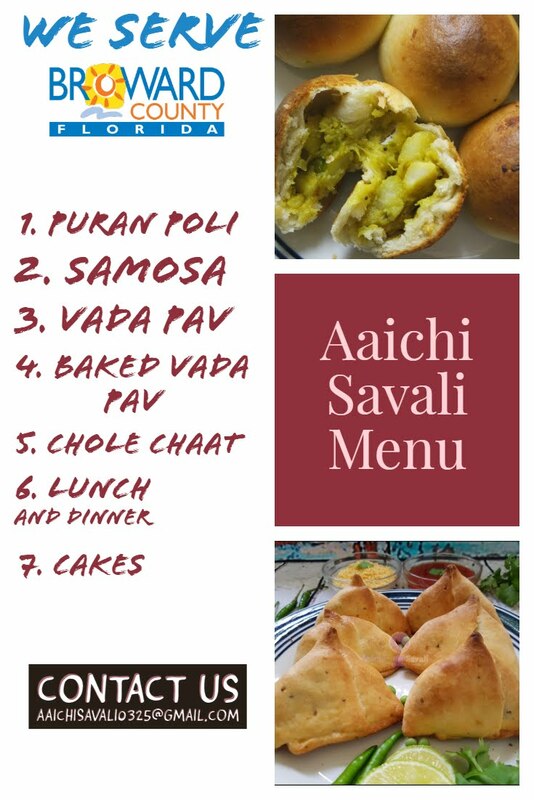 You can even make this for tiffin box if you are working during upvaas. This Rajgira Thalipeeth is a low-calorie recipe as it's not fried as like puri. 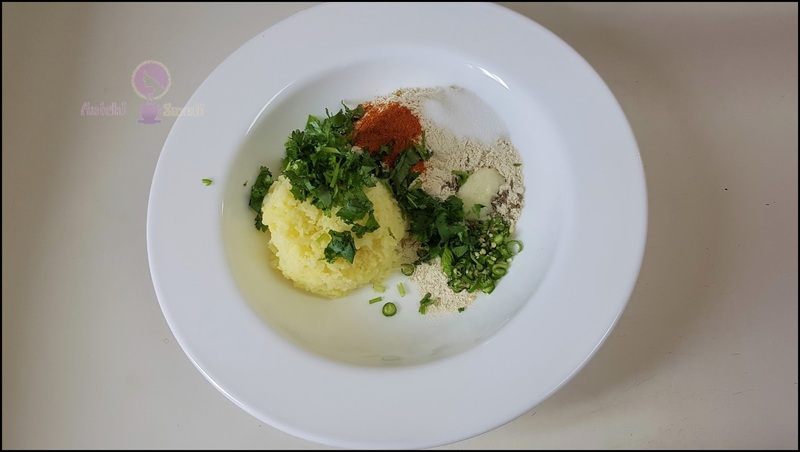 The recipe is very simple, delightful and needs few ingredients and 10 minutes of your time. 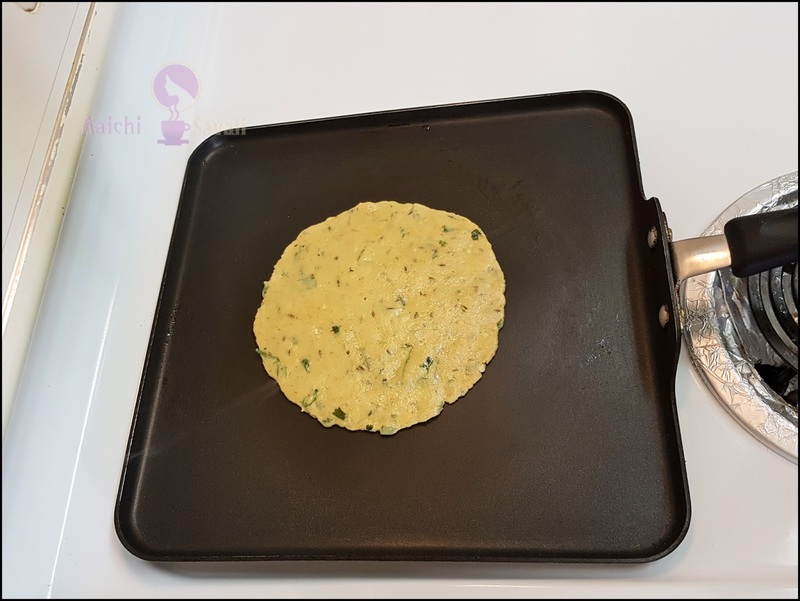 A vegetarian, vegan and also gluten free and high protein, low-calorie Rajgira Thalipeeth / Paratha are made from healthy and nutritious rajgira flour dough along with the potato. We can say it as Farali Paratha / upvas ka Paratha and makes for perfect food to take you through the long hours of upvass/fasting especially during work days. Preparation Time : 5 Minutes ; Cooking Time : 10 Minutes. Each Paratha Contains 124 kcal. Green chilli, 3 strips, chopped. 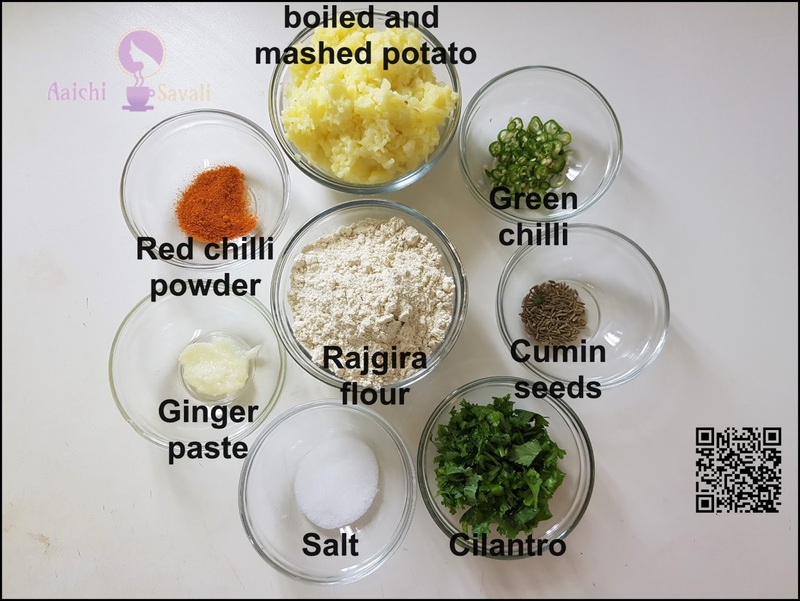 salt, coriander leaves,and mix well with hand. 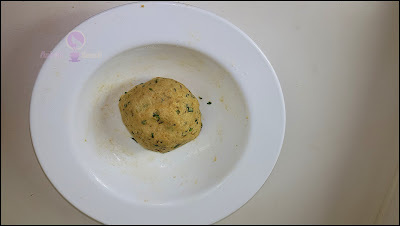 Now start adding water in small quantity and make a dough, be careful with water, add less. Make soft dough. dough on the plastic or parchment paper to form a Thalipeeth you can use rolling pin to roll paratha. If dough sticks to your fingers, just add oil over paratha and spread dough in circular shape. Or and roll one portion of dough into ball and flatten it, now just this with rajgira atta and roll gently into paratha, it will be thicker than roti and do this gently or avoid paratha from breaking, keep adding dry flour as required. Heat a tava and place rolled paratha, cook in medium heat for a min or until light brown patches starts to appear. Flip the paratha and apply oil or ghee, turn again and apply oil/ghee on another side, cook for another minute or until both sides gets cooked well. Repeat for rest of dough. Here, tasty, healthy and gluten free Rajgira Thalipeeth or Paratha is ready to serve. Serve hot or warm with curd, aloo sabzi, chutney, or anything of your falahari choice. Enjoy!!! You can avoid ginger if you don't eat. Take care while rolling, add oil well and be gentle, don't apply too much pressure. You can add grated carrots too if you like. 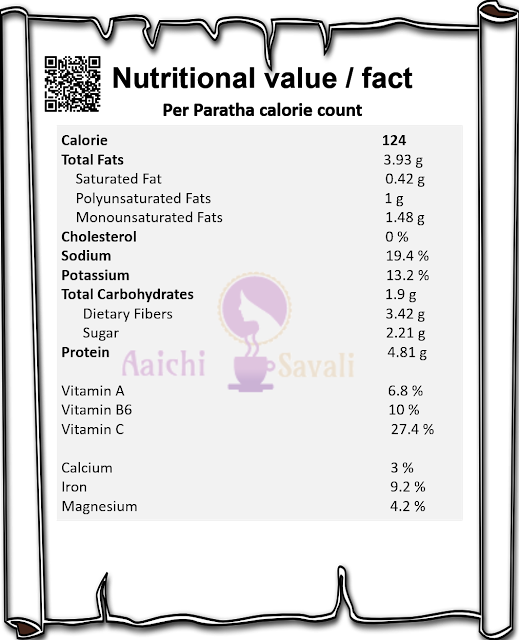 Per serving contains 124 calories, along with carbohydrates - 19.9 g, dietary fibers - 3.42 g, fats - 3.93 g, proteins - 4.81 g. As it is a good source of vitamins and minerals, it contains Vit.A - 6.8 %, Vit.C - 27.4 %, Iron - 9.2 %. Rajgira is a good source of calcium, protein and amino acids and is rich in iron, magnesium and Vitamin A, B and C too. 1. Digestion: amino acids in Rajgira makes it the perfect fasting grain. It is easy to digest and curtails hunger. Consumption of Rajgira during fasts keeps one satiated. 2. Diabetes: it is suitable for diabetics because it helps in reducing hyperglycemia. 3. Heart health: Rajgira is a heart-healthy grain, it also contains unsaturated fatty acids and soluble fiber, which help in reducing blood cholesterol levels. 4. Bone Health: Rajgira also reduces one’s risk of osteoporosis, because it has twice the amount of calcium as milk. 5. Eye Health: Researchers found that consuming rajgira on a daily basis, can help improve one’s eyesight. 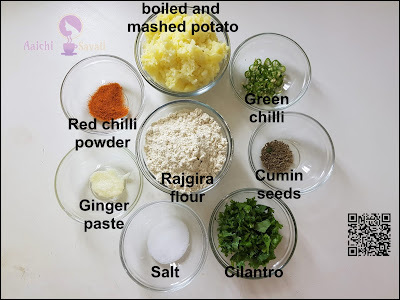 Rajgira entirely gluten-free, which means that anyone who is celiac or gluten intolerant can freely incorporate it into their diets without having to worry about any repercussions. It is good to eat Rajgira Thalipeeth / Paratha for breakfast, lunch and evening snack. Super healthy, it could be the morning boost you’ve been looking for.